Giving Tuesday is Nov. 28. Give to Save Buffalo Bayou! 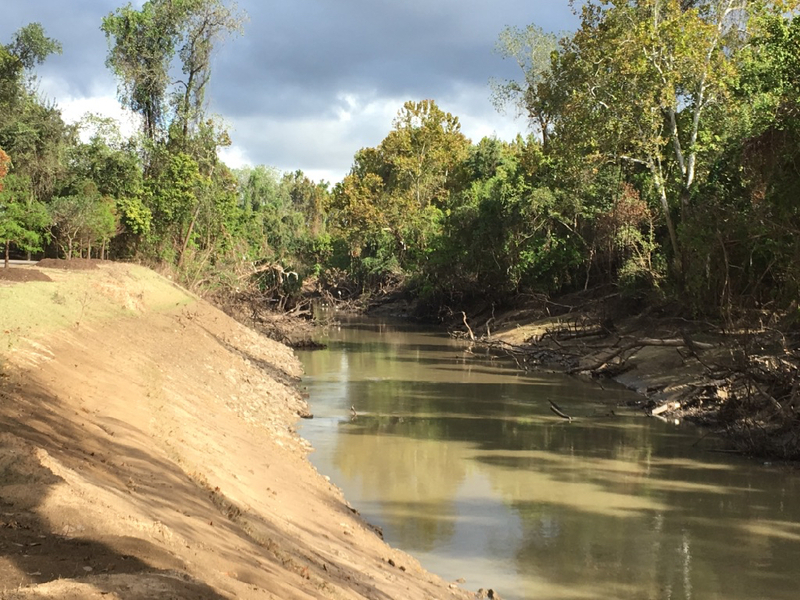 Save Buffalo Bayou is dependent on the generosity of people who care about protecting our great Mother Bayou, its forests, waters, wetlands, prairies, sandy banks, high cliffs, and many tributaries. Flood risk management based on nature is the cheapest, most effective, most beneficial practice. Help us fight for enlightened, cost-effective, green responses to flooding. Nature is not just a pretty face. Trees and vegetation cleanse our polluted urban water, reduce rain runoff that causes flooding, protect against erosion, and filter out sediment from the stream. 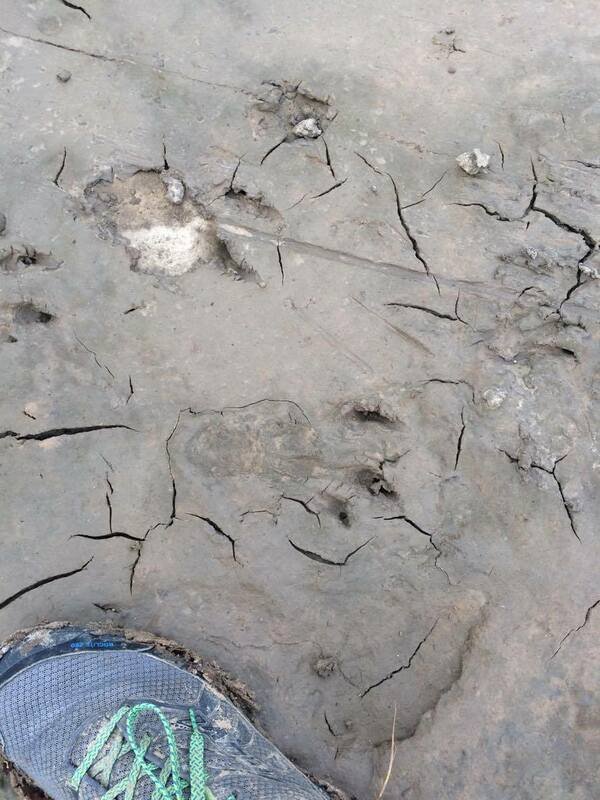 Reader Richard Lynn sent in these photos of alligator tracks on Buffalo Bayou. These photographs were taken recently on the north bank of what we called the middle meander. This is the big bend in the bayou at the eastern or downstream edge of Memorial Park. The indefinitely delayed “restoration” project proposed by the Harris County Flood Control District would fill in this meander, level the high cliffs, and reroute the bayou channel further south across the sandy point on the south side. 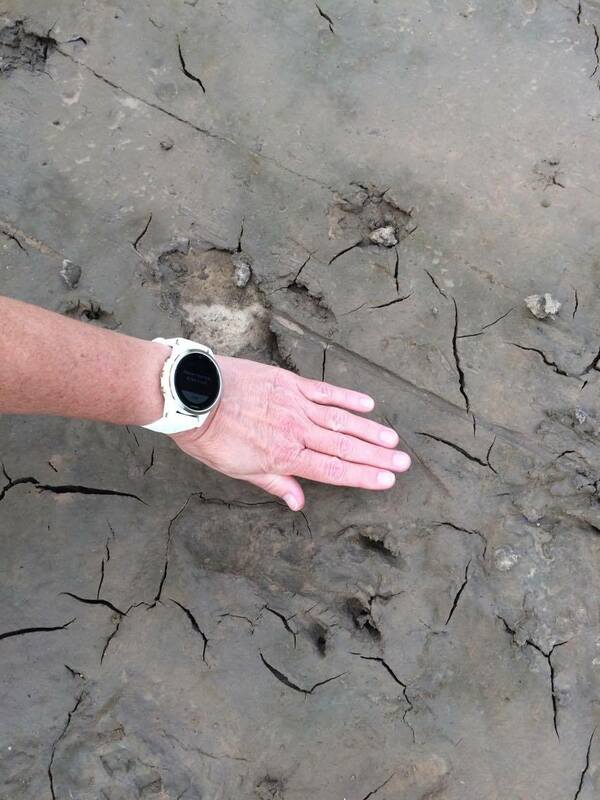 Another image taken by Lynn showing the scale of of alligator tracks. Lynn estimated the tracks were about six inches long. Lynn, a runner in the park, says the footprints were about six inches long. A reader on our Facebook page familiar with alligators estimated this one was probably six feet long. Here is what the Texas Parks and Wildlife Department says about alligators. Note that Parks and Wildlife says that alligators are generally afraid of humans and would rather just stay out of the way. 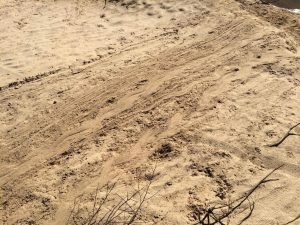 Lynn later sent in some photos of tracks that are a little more mysterious. 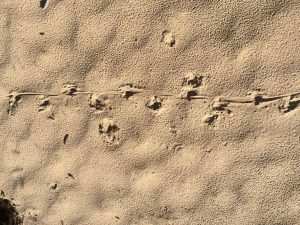 One of the pleasures of walking or paddling on Buffalo Bayou is the beauty of the patterns of tracks in the sand. The big drag track, however, is obviously a turtle. Drag marks of a turtle on Buffalo Bayou. Photo by Richard Lynn. 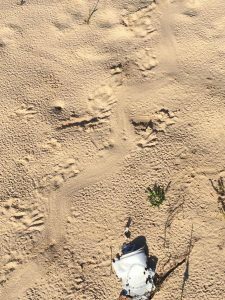 Small animal tracks with drag mark in the sand. Pattern of tiny tracks in sand. Photo by Richard Lynn. 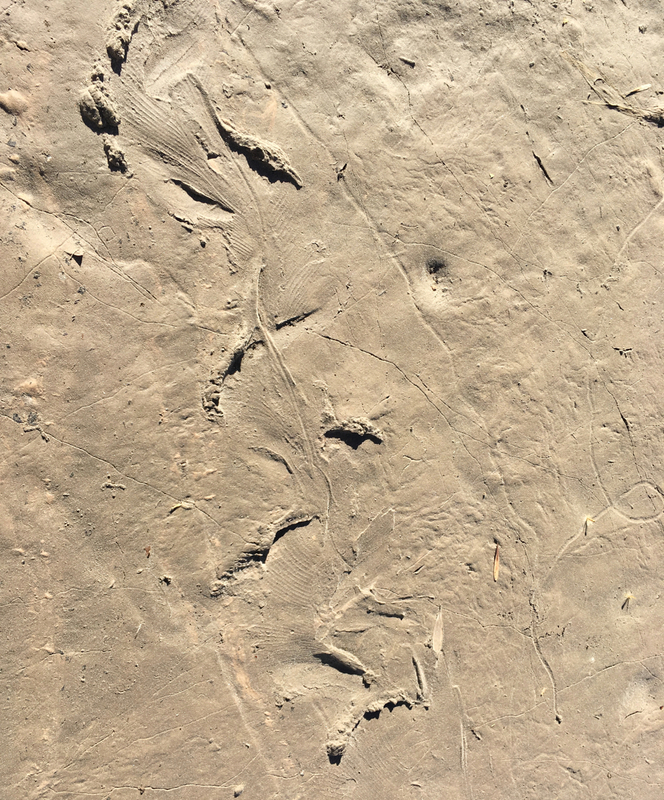 On a recent float trip down the bayou with geologist Tom Helm, we saw these strangely beautiful tracks of something that waddled, sidled, or slithered up or down the bank. Harris County commissioners will vote Tuesday, Nov. 14, 2017, on whether to authorize the negotiation of contracts for removal of trees and excavation of detention basins in Terry Hershey Park on Buffalo Bayou. 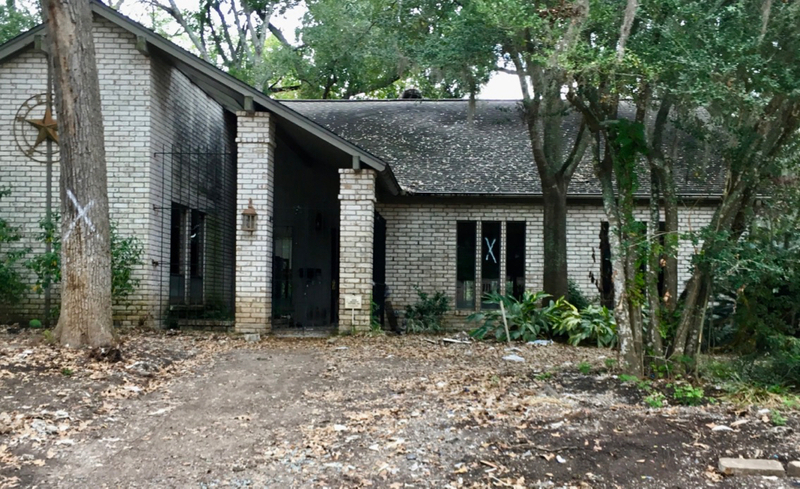 The controversial detention project has long been opposed by homeowners near the forest on the bank of the bayou, many of them recently flooded out of their homes during Hurricane Harvey. 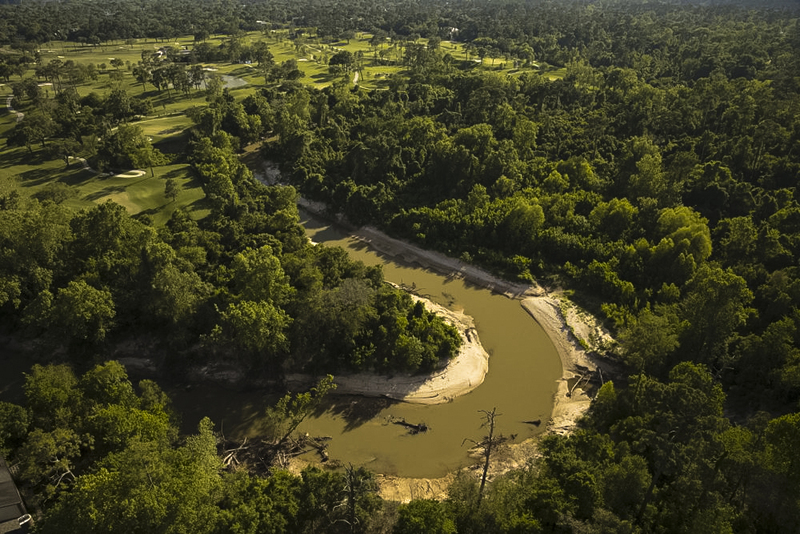 Under pressure from their group, Save Our Forest, the City of Houston in September 2015 withdrew a plan to build a large detention basin on the bayou in the park. However, the vote Tuesday includes negotiating with the City for detention on the bayou along the length of the park. The plan in 2013 was to destroy forest in order to create 280 acre-feet of stormwater detention in a series of basins on the banks of Buffalo Bayou between Highway 6 below Barker Dam and Beltway 8. Removing trees and vegetation for stormwater detention makes little scientific sense. Trees and vegetation are powerful natural devices for slowing and holding rainwater runoff, not to mention their role in cleansing our polluted urban runoff and other valuable ecological services. A study by American Forests found that a single front-yard tree can intercept 760 gallons of rainwater in its crown. Vegetation can reduce runoff from a site by as much as 90 percent, according to a study by the University of Arkansas. While it would take a whole lot of trees to store as much water as even a small detention pond, it still seems like a better idea to create artificial detention where there are no trees. Save Our Forest, the Briar Forest Super Neighborhood, and other neighborhood groups supported an alternative plan to create larger regional detention basins, in particular the Clodine Ditch Detention Basin, which would have created some 1,600-acre feet of detention. The Harris County Flood Control District last year spent over $1.25 million to fill and “repair” parts of the north bank in the park where the bayou was attempting to recover its former meanders. The US Army Corps of Engineers stripped and straightened the 6.2 mile stretch of the bayou in the park and directed the flow into an artificial channel, cutting off the meanders in the 1940s. R.G. Miller Engineers, Inc., for design, bidding, and construction phase engineering services for construction of linear detention on Unit W100-00-00 in the Buffalo Bayou Watershed in Precinct 3. The City of Houston for additional linear stormwater detention along Buffalo Bayou between SH-6 and Beltway 8 on Unit W100-00-00 in the Buffalo Bayou Watershed in Precinct 3. Buffalo Bayou is Unit W100-00-00. The public can sign up to speak during the meeting for up to three minutes. Buffalo Bayou in Terry Hershey Park. Left (north) bank is site of repairs completed in the spring of 2017, prior to Harvey. Photo Oct. 20, 2017, by SC. Some two months after the flood, neighborhoods on upper Buffalo Bayou were still haunted. A moldy, gray pall hung in the air like the Spanish moss draped in the trees. Houses were empty, their windows dark, walls stained where the dark floodwaters rose. Lawns and gardens were ruined, muddy and brown. Scattered piles of debris, broken mirrors and plasterboard, lined the nearly lifeless streets. The air, even out of doors, smelled of mildew. “They’re having a hard time being more …. positive,” said resident Michelle Foss, her voice trailing off, looking towards a house where a family with children had to be rescued by helicopter from the roof. Foss’s neighborhood is Briargrove Park. Like most of the subdivisions along Buffalo Bayou, it was developed in the decades after the federal government built two earthen dams west of Houston on what was then, in the late 1940s, mostly prairie—ranch and farmland. But the land next to the ancient meandering river, in the natural floodplain, was graced with forests of tall oaks and other trees—ideal for upscale residential development. With the construction of the dams, the floodplains were now considered safe. During heavy rains, the reservoirs behind the dams, Addicks and Barker, would hold back the waters of Buffalo Bayou, Houston’s main river, its Mother Bayou, and several creeks flowing into it, until the rain runoff collected in the bayou below the dams could empty into Galveston Bay. In the wake of Hurricane Harvey, the calls for a new or third reservoir in west Houston are virtually unanimous. It’s worth considering whether that might be a mistake.